Today, I want to share what I believe are the three biggest challenges in MLM. I’ve been meaning to write this post for several months now. I believe everyone in our industry should understand these common challenges so they can be mentally prepared to deal with them. Every serious leader I personally know deals with these three challenges on a DAILY basis. Instead of spending their time trying to figure out WHY they happen, these leaders embrace it as reality, accept things as they are, and put their best foot forward. I hope you will do the same thing. Here are the three biggest challenges in MLM, as I see it. Without a doubt, the biggest challenge in MLM is finding quality people. I’ve always been amazed at how many people join an MLM Company, yet do NOTHING with the business after they join. They never sponsor anyone, never sign up for auto-ship, never get one customer, etc. Within three or four days of joining, they stop returning your calls and messages and are never heard from again. In today’s world, it seems like you have to sponsor 20 people just to find ONE person who will put in some work. And you have to sponsor 100 people to find quality person. That’s been my experience. Why is it so hard to find quality people? First off, most people in the real world are not entrepreneurs. I’d guess that at least 9 out of 10 people who join your business have an EMPLOYEE mentality. They’ve never owned a business before. They are good people, but not good entrepreneurs. Also, most people are not doers. Most people are average. Once again, there is nothing wrong with that. It’s just that AVERAGE people don’t do much more than the minimum, and they rarely do well in our industry. We want average people with an ABOVE AVERAGE desire and work ethic. In addition, most people doing network marketing have a day job and family. Their business simply isn’t a top priority for them. They treat it more like a hobby than a business. They might say they want big success, more money and time freedom, but their actions prove otherwise. Only a small percentage of people reach the top in ANY profession. Most realtors never sell one home. Most insurance agents never sell one policy. Most businesses fail. Most companies have hundreds, even thousands of employees, but only one CEO. Finally, most people in our industry do not APPROACH success minded, entrepreneurial people. Instead, they approach unqualified prospects. They recruit DOWN, rather than recruiting UP. Yes, I might sound harsh. But these are the facts. I think so anyway. The beauty of our industry is that you only need to find 2-5 quality people to build a HUGE team. You will just have to talk to thousands of people to sponsor hundreds of people to find those 2-5 quality people. To find quality people for your business, look for people who are leaders. Look for people who are success minded. Look for people who are in the top of their chosen career field. Look for people with a good attitude, a large sphere of influence and credibility. Look for people who are sick and tired of being sick and tired and are truly ready to change their life. Recruit up whenever possible! The second biggest challenge in MLM, as I see it, is attrition. This is something very few leaders in our industry talk about. Why? Because it is downright scary. Based on my own experience, and talking with my successful friends in other MLM Companies, attrition in our industry is around 75 to 90 percent per YEAR. What does this mean? It means that if you have 100 people on your team today, 75 to 90 of those people will not be in the business one year from now. Crazy, isn’t it? The biggest reason that attrition in so high in our industry is that we do not have a filtering process like traditional businesses do. Anyone can join. To start a traditional business, you need to have a certain amount of capital, work experience, a good credit score, references, etc. You are put through the ringer by the bank, government and regulators just to START a business. The non-serious and unqualified people are screened out. In addition, most people joining network marketing simply do not have a FINANCIAL stake in their business. They’ve only spent $50 to $500 to get started, so it’s easy to put the business on the back burner when life gets in the way. Compare that to a traditional business owner who invested $100k to start their business. They will do anything and everything to make their business work, because they have so much money invested. Not so with network marketers. Attrition will always be high in your business. This is a business of attrition. Even if most of your team quits every year, you can still earn a HUGE income in network marketing. To minimize attrition, you must give people something to lose. Help people get a check quickly and help grow a team under them so the fear of loss sets in. Give people good training. Have a system people can use. And, make sure your team has realistic expectations. Everyone talks about duplication like it is a magical word. I’d call it magical, because it rarely happens. In my own words, duplication is getting other people to recruit and retail. It’s getting a lot of people to do a little bit consistently, over a sustained period of time. That’s the whole SELLING POINT of MLM, the leverage. You build a big team, a lot of people each do a little bit, and you earn an override off all of those folks. In theory, it’s amazing. It’s a much better deal than being a one-man band and only getting paid on your own personal production. Duplication sounds wonderful. It just rarely happens. Some people teach that all you need to do is go out and find 2 who get 2 who get 2, etc. I have never seen this play out once in 17-years. Instead, it’s more like this. You recruit 20. 16 drop out in one to three months. Three of those 20 people sponsor one to three people and one of those 20 people is a go-getter. Any leader who is being honest with you will tell you the same thing. Moreover, some folks will say your team will do what you do. That is NOT true. I’ve personally sponsored around 250 people in my company and not one person in my team has done that. Out of those 250 people, less than 10 people have even sponsored 5 people. Only two of my personal recruits are as serious as I am. Duplication as we are taught is a myth! You must accept that duplication as it has been shared with you is a lie. Instead, you must realize that most people will do nothing, some people will do a little bit, and a very small select few will do a lot. Have a system for the 97% of your team to follow. Teach them in a group setting. Be nice and never pressure them to do more with the business than they want to. Encourage everyone. But, spend your time with the workers, where it is deserved. There you have it folks. These are the three biggest challenges in MLM, as I see it. Do you agree of disagree with me? 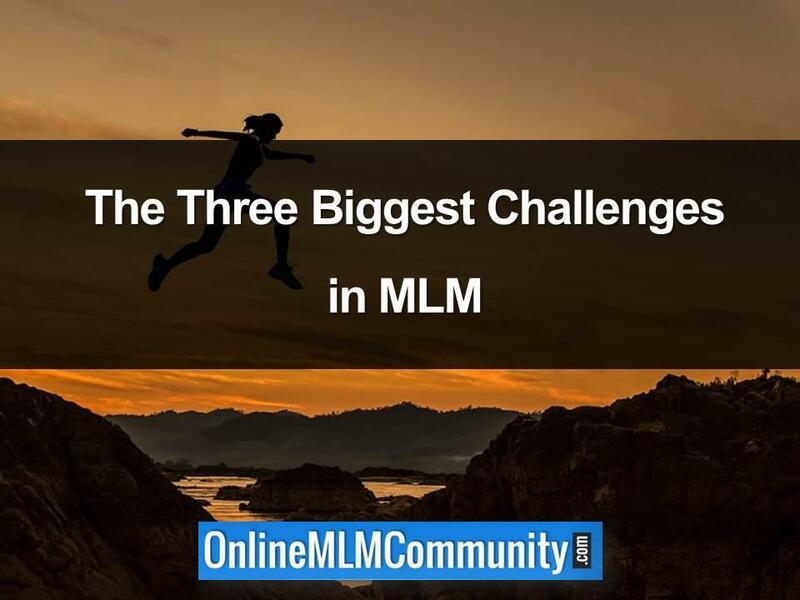 What do you think are the three biggest challenges in MLM? Leave a comment below to let me know what you think. I look forward to hearing from you.